What Type of Stand Mixer Type? Rotating Disc: A single flat beater mounted on a rotating disc, which moves like a planet orbiting the sun — simultaneously spinning on its own axis and travelling a circular path around the bowl. This "planetary movement" creates more contact between the beater, inner bowl and ingredients, keeping them from getting stuck to the sides. Fixed-Beater: A conventional type of mixer using one or two fixed beaters with a rotating bowl. Slower than the rotating disc mixers. Need to be monitored, so the excess mixture doesn't gather at the sides. The more speeds, the more control you have over your mixing. Less "shock" between each speed means the contents are less likely to spray everywhere when you accelerate. Look for at least five speeds. Slow speeds mix dry ingredients without flinging them out of the bowl. Use faster speeds to whip cream or egg whites. 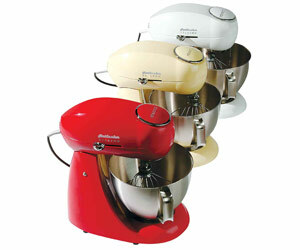 Stand mixers range from 250 watts up to 1,000 watts. General household applications shouldn't require more than 500 watts. Above 500 watts will suit "serious" cooks. A flat beater for efficient stirring and blending. A wire whisk for whipping tasks. A dough hook for kneading bread. Stand mixer bowls hold anywhere from 1.5L to 7L. 4L to 6L should be plenty for most cooks. Metal bowls are durable and should last the life of the mixer. A bowl with handles is convenient for pouring mixtures. A splash guard prevents ingredients from spilling out. Heavy-duty mixers can weigh over 10kg, so they are often left on kitchen bench tops. The heavier a stand mixer is, the less chance it will move around during operation. Power: Ranges from 250 to 1,000 watts. Attachments: Look for a flat beater, wire whisk and dough hook at minimum. Speeds: Choose at least five or six speed variations for the best control. Bowl: A capacity of 4 to 6L is plenty for most cooks. Additional attachments: Juicers, meat grinders and pasta makers are handy.